A scene from the Broadway musical, Sunday in the Park with George, which graces the cover of the new book on Stephen Sondheim by Robert McLaughlin. Stephen Sondheim could be called the name in musical theatre. His prolific work as a lyricist and songwriter includes such musicals as West Side Story, Gypsy, A Funny Thing Happened on the Way to the Forum, Company, Follies, Assassins, Sunday in the Park with George, Into the Woods, and Sweeney Todd: The Demon Barber of Fleet Street. Sondheim could also be called a postmodernist because his work flouts popular notions of musical theatre. That is the argument of Robert McLaughlin with his new book, Stephen Sondheim and the Reinvention of the American Musical. A postmodern literature scholar who also writes about World War II cinema and the American musical theatre, McLaughlin employed the same tools he uses when studying postmodern authors like Thomas Pynchon to analyze Sondheim’s famed lyrics and songs. 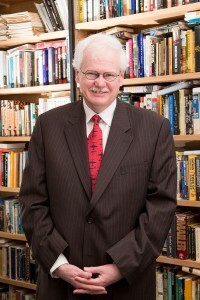 Generally associated with the arts and architecture, postmodern thinkers tend to scoff at the idea that all mankind is connected by any grand theme or message. The status quo is often rejected, with a special disdain reserved for society’s expectations. 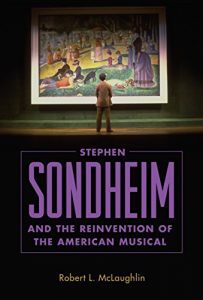 The idea of both scholars and fans finding something new in the book is important to McLaughlin, who is himself a Sondheim fan. He touts Sunday in the Park with George as a personal favorite, after he saw it on Broadway with Mandy Patinkin and Bernadette Peters in 1984. “I would say Follies is my favorite, but my wife is forever reminding me that she saw it on Broadway, and I did not,” he said with a smile.